Why did I, a Female Guitarist, decide to also become a Guitar Teacher? This is a question I get asked ever so often. Probably more so than my counterpart male guitar teachers. Especially since I teach, among all the basics, Shredding Guitar, Heavy Metal and the gymnastics which are a sign of modern guitar playing. I am well versed in most styles, including Blues, Jazz, Pop, Reggae, Acoustic guitar but.. let’s face it.. Guitar Shredding is fun!. In the end though, it all starts with the basic tools and knowledge. What you make with it, when you have it, and which style you want to apply it to, is up to you. because I like to lecture. About my favorite subject Music. Throughout my playing career I found myself constantly explaining things, demonstrating, counting out rhythms (even for drummers), to my then band mates or attending spectators. I enjoyed it. I realized that by passing on knowledge I felt a sense of satisfaction and musical fulfillment, that was almost as great as a successful live show. by being a Female Guitarist? Hell yes. Ever so often some stubborn drummer who thought he had the god sent gift of rhythm, did not take kindly to my redirection of his parts. I argued that he would face the same criticism from a studio producer or arranger, so why not from me? 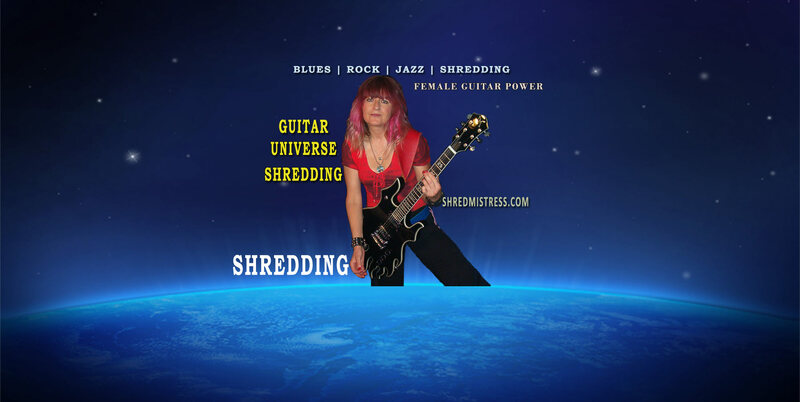 Answers: "You can’t be that qualified being a Female Guitarist and besides, I don’t take direction from a woman"
that I played with some really great musicians who taught me much about music? Or that I studied music diligently since I began to play guitar? Not to some. Ego is stronger than reason. I did fairly well getting my messages across. Which then, brought me to the point of adding Teaching Guitar to my repertoire. as it might appear to be. Being a good or even great guitarist does not make someone automatically become a great guitar teacher. Teaching is a skill that requires organization, verbal tools, oratory skills, continuity, patience, and of course foremost, an extensive vocabulary of musical skill, both written and playable. that there weren’t a whole lot of Female Guitar Teachers out there. We have plenty of Female Guitarist at this time, but not many decide to become guitar teachers. Women and girls like and need female role models. In the guitar field especially. What better place for a Female Guitarist to be than also teach guitar. to hear comments from my closest friends who thought I should teach guitar and music. ‘I’d be a ‘Natural’… At first I brushed it off. Not me. I’m kinda short in the ‘patience’ and ‘catering’ department. Plus a lack of diplomacy might be an issue LOL. I did enjoy whenever I got a chance to show someone a piece or riff or explain how something worked. Why not after all make this part of my life and income? and I haven’t looked back. Despite a busy recording and touring schedule I LOVE teaching guitar. A great decision it was indeed. I hope my guitar students find it as rewarding as I do. They must… they keep coming back. I have a private guitar practice in Los Angeles (Sherman Oaks). And teach Guitar Online via Skype. Best Guitar Lessons for Adults with Female Guitarist and Guitar Teacher, Los Angeles. Learn how to play Guitar, Metal, Rock, Blues, Acoustic, Scales and Modes. Theory, Beginning Guitarists to Advanced Players.